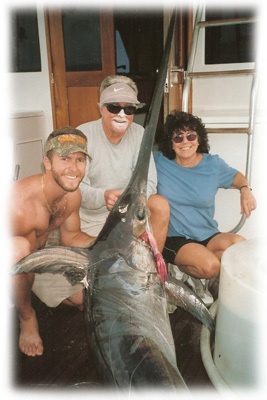 Ken & Rochelle Knudsen and amberjack! Ken Knudsen & daughter Rochelle display a nice amberjack! Max Mayfield, our friend and previous director of the National Hurricane Center, with a nice permit! John Watson with his son Michael and a nice permit they caught! Angler Bob Rogers catches a permit with Capt. Vic Gaspeny, still in the water! Ricky Stanczyk and a nice little permit! Ricky and Ron display a nice gulf permit! Our friend from Scotland, Ricky Walker, with a nice permit! Nice double header permit!!! Tough catch! Nick Stanczyk with a world record African Pompano. 37 lbs!